Welcome to DOG GUARD of Rockford. 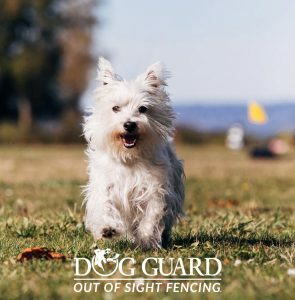 Dog Guard Out of Sight Fencing headquarters is located in Troy, New York. They have been manufacturing top-of-the-line American made pet containment systems for over 25 years. Currently, they have over 200 dealers nationwide. Tim currently owns a general contracting business in the Rockford, IL region and was looking to start another business that would be physically less taxing and provide a quality product and service. The opportunity to purchase an existing dealership that covers Winnebago, Boone, Ogle counties in Illinois and Rock county in Wisconsin availed itself late 2017 and he jumped at the chance. Tim’s lifelong love for dogs and helping people is a perfect fit for Dog Guard. His past experience as a job foreman, project manager, youth minister and current business owner of 11 years has given him the customer service skills and technical knowledge that will best serve you! Tim and Deb Fountain have been married for over 20 years and have 2 teenage children and a German Shepherd Dog named Tripp. German Shepherds are the family’s favorite breed and they have owned 3 German Shepherd Dogs and a Rottweiler. Tim is happy to represent the best brand in the business that utilizes top quality components to create the most secure Out of Sight Fencing system on the market. He is a firm believer in quality, integrity, and superior customer service. You will receive all this and more when you choose Dog Guard of Rockford.